Where are the t.v. shows capturing artist rapt in enthusiasmos instead of stars stumbling in and out of buildings and cars? While typing up purple prose from my hand-written manuscript (Dirty parts, yay! Also: yikes and ugh!) I came across this quote from Anne Sexton I jotted down from a podcast in June 2012 (where I was in my manuscript). The quote is over-the-top. 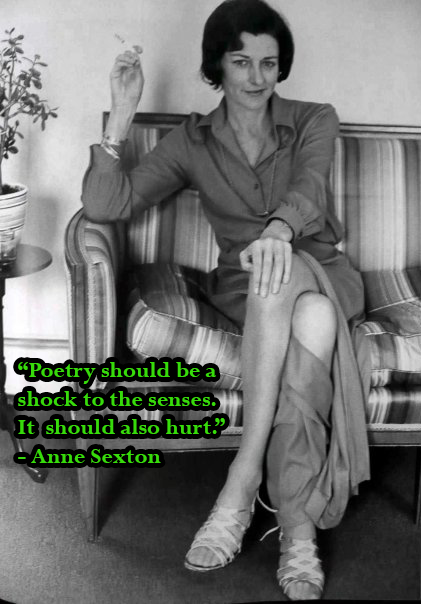 Most anyone can think of good poetry that isn't extruded from the writer's marrow. But then I saw this photo and laughed and decided to put it all together. Don't know what the deal is with the dress, but fair guess it was funny. Check the cigarette cherry!